Paris Ends 'Odd Or Even' Limit On Cars After One Day : The Two-Way 'Impair Ou Pair?' To combat smog, officials restricted car use Monday. For the most part, only cars with odd-numbered license plates could be on the streets. The rule will end after today. 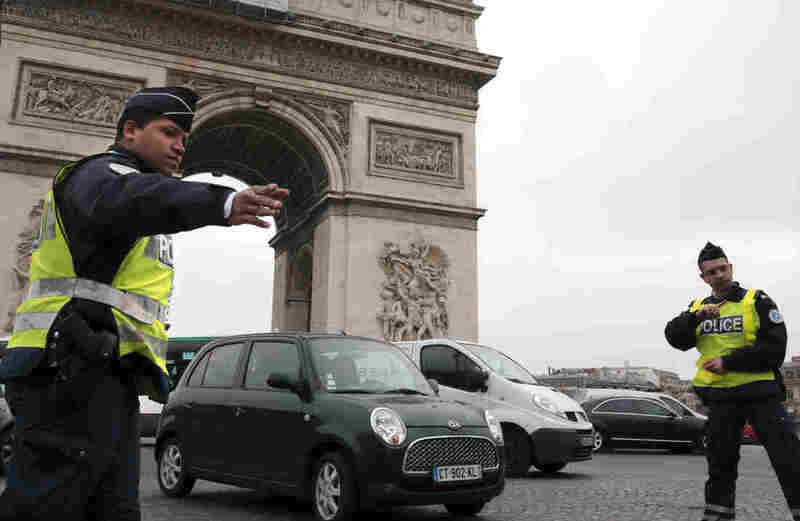 Police were checking cars throughout Paris on Monday, including near the Arc de Triomphe, as the city tried to cut air pollution by instituting odd-even driving restrictions. Hoping to cut down on air pollution that in recent days has reached dangerous levels, city officials in Paris on Monday began trying to cut automobile emissions by enforcing an odd-even system of traffic rules. For the most part, only cars with odd-numbered license plates could be on the rues et boulevards Monday (since it's the 17th of March). On Tuesday, the city's streets were to be open only to cars with even-numbered plates. French officials say the rule banning roughly half of Paris' car traffic from the city's streets will not be in effect Tuesday. Minister of Ecology Philippe Martin says 90 percent of Parisian drivers followed the rules today, according to Le Monde. He said new data shows a "clear tendency toward improvement," citing changes in weather patterns that have contributed to the city's smog. But not everyone observed the ban: Police issued some 4,000 tickets to drivers whose cars have even-numbered plates, hitting drivers with a fine of around $30, according to France 24. "I know it's not great to say it but I'm willing to take my car and pay the fine to get my kids to school, because I don't have the choice," one woman told the TV network. The restrictions apply in the city and 22 surrounding suburbs, according to France 24. There are exemptions, the news network adds, for electric and hybrid cards, and "any vehicle carrying three people or more." Motorcycles are subject to the odd-even rules. City officials have taken another step, as well: Public transport systems will be free as long as the odd-even rule applies. How long the odd-even rules will last isn't yet known. "Paris and much of northern France have been suffering under high pollution levels for several days after an extended period of cool, dry nights with much warmer daytime temperatures — climactic conditions that do not allow pollutant particles to disperse. "Paris is also more prone to smog than other European capitals because of France's diesel subsidies and its high number of private car drivers." The odd-even restriction has been used in Paris once before, in 1997. The BBC's Hugh Schofield reports that on Monday it wasn't hard to spot even-numbered plates on the streets, but that "most cars on the roads [were] indeed odd-plated, and traffic [seemed] lighter than usual." Still, according to The Associated Press, by midday police had issued nearly 4,000 tickets and 27 cars had been impounded. "Paris' anti-pollution efforts trail far behind those of some other cities. Athens has had a similar alternate driving ban in place for many years; in the Greek capital is has contributed significantly both to reducing pollution and reducing traffic. "Sao Paulo, Brazil employs a more complicated license plate-based system that assigns each car a day of the week on which it cannot be driven during morning and afternoon rush hours." Chinese officials imposed odd-even driving restrictions in Beijing before and during the 2008 Summer Olympics there, both to help clear the air and cut down on traffic congestion. Some Two-Way readers, and this blogger, are old enough of course to remember the gasoline crises of the 1970s and the odd-even gasoline rationing they led to in the U.S. The aftermath of Hurricane Sandy in 2012 also forced officials around in the New York-New Jersey region to impose odd-even restrictions on gas purchases.